Motladdu is a very simple and easy to prepare snack. It has been prepared for generations in my family by great grand mothers both as a savory and a sweet snack. It is a very tasty snack. I remember very well my mother used to prepare it during every summer school vacation along with several other home made snacks for me to munch on. I have no idea why the name motladdu. When I asked my mother she said she never asked her mother that question and hence has no idea. I love the savory version more than the sweet one and can keep munching on them all day long. I want to learn all the snacks that my mother prepared and make them to relive my childhood and to cherish the childhood memories. 1. In a mixing bowl add the wheat flour, salt and ghee and mix well. 2. Add water little by little and knead to a soft but stiff dough. Knead for 8-10 minutes. 3. You can keep it aside for 30 minutes or start using it right away. 4. Divide the dough into 3 portions. 5. Take one portion keeping the other 2 covered. 6. Roll it into a disc using a rolling pin by dusting some wheat flour. Do not roll it too thick or too thin. Roll to the thickness of a chapatti. 7. Using a sharp knife cut diagonal strips spaced 1 1/2 inches apart. 8. Next cut vertical strips to make square shapes out of the rolled dough. 9. You can cut the squares as big or as small as you like. Remove the curved corners and keep it with the remaining 2 dough portions. 10. Taking one square at a time, bring two opposite corners together, twist them and press to seal. 11. Now turn it around and bring the other two opposite corners together, twist them and press to seal. This forms a shell shape. 12. Repeat this with all the squares. 13. Repeat the procedure with the remaining dough till shells have been formed with all the dough. 14. Heat oil for deep frying. Drop the prepared shells one by one and fry on medium low heat without over crowding the frying vessel. 15. Fry till they turn golden brown and well done. 16. Remove on to absorbent paper towels. 17. Fry all the prepared shells in the same way and let them cool down. 18. 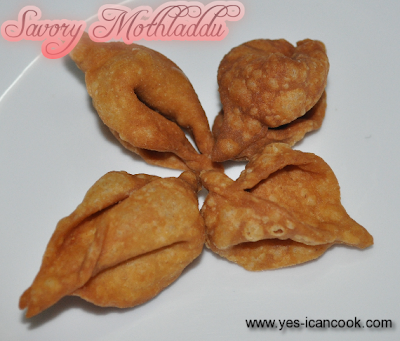 Savory motladdus are now ready and can be stored at room temperature in an air tight container for up to a week. 19. 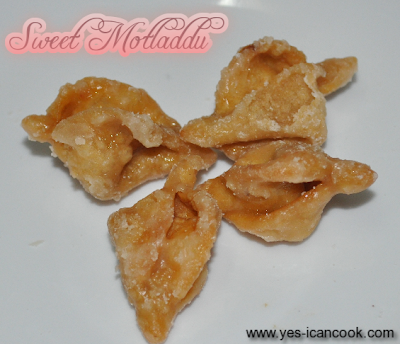 To prepare sweet motladdus, in a saucepan add sugar and 1/8 cup of water. Bring the water to a boil and stir continuously till the sugar dissolves. Continue to cook over low flame till sugar syrup reaches 2 string consistency. 20. Switch off flame and drop some (about 30) of the motladdus into the sugar syrup and stir till the sugar crystallizes and sticks to the motladdus. Sweet motladdus are now ready. These can also be stored at room temperature in an air tight container for a week. Enjoy Motladdus. I prefer savory motladdus to sweet motladdus. 1. Make more sugar syrup depending on the number of sweet motladdus you want to make.